18 hole golf course and spa just a stone's throw from Paris and 3 Michelin starred chef, M. Marc Meneau's, name attached! Renowned three Michelin starred chef M. Marc Meneau of l'Esperance fame has taken over this lovely property and transformed it. He has installed one of his prize young chefs, Steve DELAMAIRE, as Chef de Cuisine ably assisted by Jean François LEVESQUE as Chef Patissier, in the kitchen with the goal to producing fine cuisine but not trying to aim at a 3 star level. And he is succeeding admirably! So much so that it is worth the trip just to dine here. But food by itself does not make the whole experience. M. Meneau convinced the other half of the Bernard Loiseau act, M. Hubert Couilloud, to manage the place, a prize indeed. M. Couilloud was the best friend and maitre d' of Relais Bernard Loiseau for 20 years, right from the beginning and a more experienced and gracious person you could not hope to find to run the dining experience for critical gastronomes. We are sure that part of the appeal for him is that his charming wife, Françoise, runs the hotel; an ideal team! View of the Chateau to the left, the main hotel and restaurant building to the right with the putting practice green in the foreground. On the links with the Chateau in the distance and a pond to the left. The rooms and suites are all on the second floor which have open ceilings filled with traditional pegged wood beam systems. 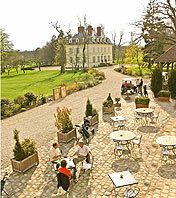 Golfers enjoying a well earned refreshment on the terrace of the hotel with a fairway in view and the Chateau in the background. The Domaine consists of the charming, small Château du Roncemay and the hotel/restaurant complex a few paces away and boasts a world class 18 hole golf course, spa and other outdoor activities. Todays Domaine was begun in 1995 when the structures were restored in true traditional Burgundian style inspired by the country manor houses of the 1800's. The 18 hole golf course was laid out as well as the new spa and completed in 1997. Even in the middle of winter, with a blanket of white snow, the fireplaces inside radiate the warmth of a country welcome. In spring, the wild flowers blanket instead of the snow and the blossoms create color all around. Summer is heaven. Marc Meneau's intention was not to create another l'Esperance but to expand the type and style of his offerings. Domaine du Roncemay is just 1 1/2 hour's drive away from l'Esperance at Vézelay, so a 3 star meal is within reach while a simpler but excellent dinner is available just below your room. There is even a light lunch menu served inside or on the terrace overlooking the links from the bistro "Le Club-House". Owner and 3 Michelin star rated chef, M. Marc Meneau. Pool to the right, rooms 2nd floor left and dining rooms ground floor left. Spa is just a few paces behind camera position. Typical of the charming interiors of this lovely hotel. The rooms and suites are styled in the traditional country French manner with open beamed ceilings, antiques, very comfortable beds and fully modern bathrooms. Most have a view out over the acres of fairways and woods. Internet connection, TV by cable and satellite are standard as is mini-bar in every room. Most rooms are air conditioned. Most rooms have tall French windows which flood the rooms with light and air. But the designers were considerate enough to provide each window with not only a railing and grill for safety but also a Plexiglas shield to prevent accidents with very small children and pets. The heated swimming pool is just below the rooms and two steps from both restaurants and the cozy bar and lounge. The Spa is just a few paces from the pool with massage and Turkish baths and gym with exercise machines. Tennis just another couple strokes away as is the Pétanque court. The Domaine sits on 145 hectares (approx. 300 acres) of a natural reserve including green pastures, woods, lakes and ponds and further on the hills and vineyards. These can be explored on foot or bicycle. Equestrians will find stables nearby and wine enthusiasts will find the area teeming with vineyards and wine tasting cellars. The dining room with window walls around 3 sides that show the golf links as far as the eye can see. M. Meneau did not want to recreate l'Esperance here; rather he wanted to establish more of an every day restaurant, of excellent quality, but simpler preparation and more affordable. Working with Chef Pascal GUELLEC who learnt the ropes with Lucas Carton they developed a menu that changes with the seasons as well as a menu that changes with what is fresh at the market. It is indeed excellent. There is a a cornucopia of fine seasonal produce that appears on your plate: foie gras poached and marinated in a spiced reduction of red wine; pastilles of snails with garlic and parsley, and mushroom velouté; pan-fried scallops with toasted walnuts, endive Julienne and apple juice with cider and a duck magret with a Juniper jus and celery sauerkraut with pink berries. Lemon Tart to die for! Entré with a "soup" of Petits pois with lettuce and écrevisses sitting on an island of mint. M. Meneau, like many chefs today, offer their own branded wines. In his case, they are very drinkable wines from the hillside vineyards of Vézelay. Both the white and red complimented our meal well. Our meal was a pleasure taken in the semi-traditional dining room with the sun streaming through wall of windows giving glimpses of golfers still on the links. One of the "Hamman" style Moroccan steam rooms. The Spa at Domaine Roncemay. Another of the "Hamman" style Moroccan steam rooms. The Spa and Fitness center offers an exercise room with a variety of machines to burn off calories. There are also other activities such as the marvelous walking through their 325 acre natural park reserve with beautiful pathways and green pastures, lakes and ponds. Then outside the grounds are miles of hills and vineyards to hike through or use the bikes supplied by the Domaine. The countryside is gently rolling, so biking is not a great challenge to the less than athletic. There is a tennis and pétanque court as well. The Spa has a couple of "Hamman" style Moroccan steam rooms, massage and body and skin treatments.